Welcome to the area of our website dedicated to the International Kokondo Association (IKA). The IKA is a traditional martial arts organization that teaches and governs the martial arts of Jukido Jujitsu and Kokondo Karate. 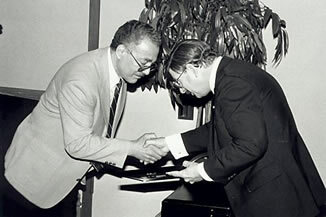 The history of the International Kokondo Association (IKA) is linked with the history of its founder, Shihan Paul Arel. 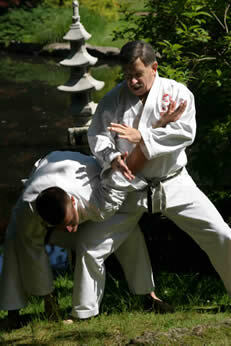 Shihan Arel was involved full-time in martial arts from 1950 to January 2009. The Jukido method of jujitsu began its formal introduction in 1959. The IKA and its karate style were formally established in 1970. There are many aspects to the IKA. The organization and the traditional martial arts it established are unique in the realm of the modern martial arts organizations. Only individuals with IKA Instructors certification, current rank credentials, and written permission from the Honbu (world headquarters) dojo can teach either Jukido Jujitsu or Kokondo Karate. 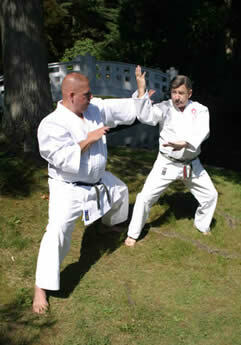 Shihan Paul Arel established the International Kokondo Association in 1970 with several clear objectives. Paramount among these objectives was the need to preserve the integrity of traditional martial arts as methods of practical & effective self-defense in the present day. To maintain the authenticity, integrity, and effectiveness of jujitsu & karate as legitimate systems of modern self-defense (Jukido Jujitsu & Kokondo Karate). Honbu (world headquarters) is the leading authority as it pertains to the governance of Kokondo’s jujitsu & karate. Who we are / What is Kokondo? Therefore, Kokondo is not a non-traditional system emphasizing “sport” or hobby that closely mirrors a physical fitness routine rather then effective self-defense. Recently others have focused on developing “toughness” and fighting, not self-defense. The primary purpose of the IKA is to continue Shihan Paul Arel’s pursuit of the highest ideals of traditional martial arts in both technique & personal character. Traditional Japanese martial arts are categorized as either bujutsu or budo. Bujutsu (martial art) are the older Japanese systems and are quite literally the martial arts of Japan. The sole purpose of bujutsu is the effectiveness of techniques in real situations. Budo (martial way) are the sibling of the older bujutsu. Budo tend to focus less on practical applications of techniques for realistic self-defense. Rather, the focus either revolves around sport, the aesthetics of technique, or the perfection of the moral fiber of the student. Kokondo is fascinatingly both bujutsu & budo. Kokondo is bujutsu from a technical perspective. This is true because all of the physical aspects of Kokondo training ultimately come back to the objective of practicality and effectiveness in present day self-defense situations. Techniques are not assessed for value based on simply how well they may or may not work under the “rules” of competitions, how the technique “looks”, or any other measure. The focus of all techniques & training methods are assessed for utilization in realistic self-defense. Appropriate Response – Dealing appropriately & justifiably with an attacker on the street and applying the same care and attention to aspects of daily life. The desire to train hard which develops personal integrity, strength, and discipline. Mutual Benefit and Welfare. All instructors of either of the IKA’s martial arts, Jukido Jujitsu and/or Kokondo Karate, emphasize safety and focus/control (kime) in training. Seven Codes of Bushido, as mentioned above. The name Kokondo translates to mean, ‘The way of the past & present.’ Therefore, Kokondo preserves the integrity, authenticity, and effectiveness of the time tested techniques of past masters & sensei, but does so in a manner that applies the needs of modern day realistic self-defense. Kokondo utilizes this approach to fulfill its dual objectives of preserving the techniques and intent of classical martial arts, while at the same time meeting the reality of self-defense situations, as they exist today. Additionally the name Kokondo encourages students to learn from the past and to apply those lessons to their present, both inside and outside of the dojo. This lesson works for both children and adults. KOKONDO- the Way of The Past and Present is keeping traditions alive, now and for the future. The membership of the IKA benefit not only from a vast number of training partners from around the world but also from the friendships that are born and cultivated with fellow Kokondo students. The bonds developed in individual Kokondo dojo are deep and do truly resemble a family. Incredibly, these bonds extend beyond individual dojo and expand across the entire international organization. The spirit of camaraderie is often commented on from students of Kokondo both new and old. The IKA takes pride in drawing from such a diverse group of individuals. The diversity of Kokondo is one of its most significant strengths. All students not only benefit from the traditional martial arts of Kokondo, but also contribute in building the strength of the Kokondo fabric. The official regional representative body for the IKA is the Florida Jukido Jujitsu Academies (FJJA). The FJJA is lead by the IKA’s National Jukido Jujitsu Director, Master George M. Rego (godan), a direct private student of the founder until the founder’s passing.